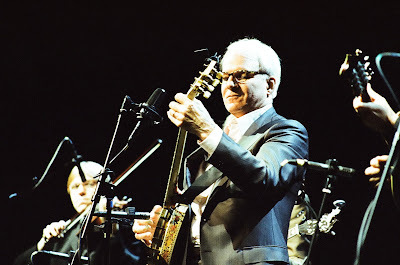 choir croak out them goodies: Steve Martin's Big Bad Banjo and a Conversation with Dave Barry. Club Nokia. Los Angeles, CA. 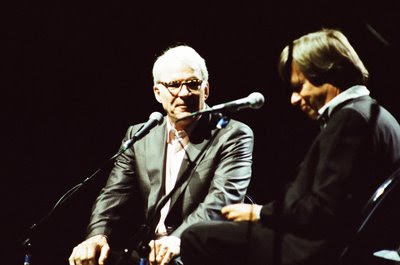 May 11, 2009. 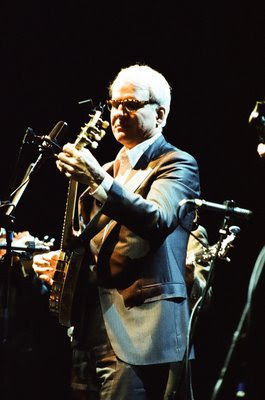 Steve Martin's Big Bad Banjo and a Conversation with Dave Barry. Club Nokia. Los Angeles, CA. 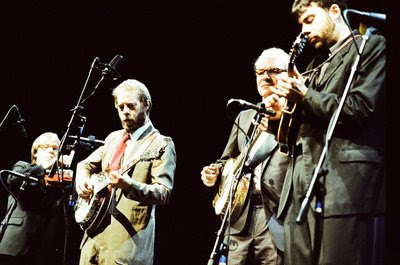 May 11, 2009. I've never wanted to act, but if I had to take any role in a film, of my time or otherwise, I'd take Bernadette Peters' place in The Jerk. Why? 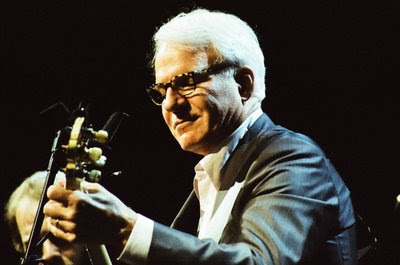 So I'd know the pleasure of Steve Martin licking my face. 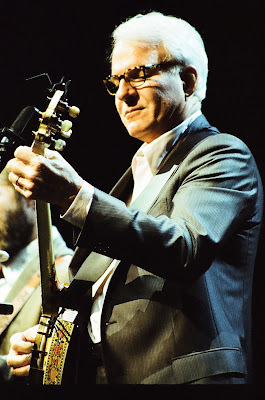 Imagine my delight, then, in finding that I'd have the chance to photograph Steve himself, 63-years old yet still mysteriously ageless (and no, he doesn't look nearly as waxy in person as he does on camera these days). 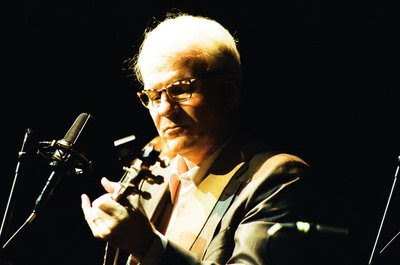 Alongside North Carolina's Steep Canyon Rangers, whose bluegrass harmonies formed so smoothly that only the perfect clarity of Woody Platt's guitar strings (and the spontaneity of Martin's singing voice, later) provided proof of the band's live presence, Steve Martin showed off 40 years' worth of banjo practice in a successful effort to raise funds for the Los Angeles Public Library. 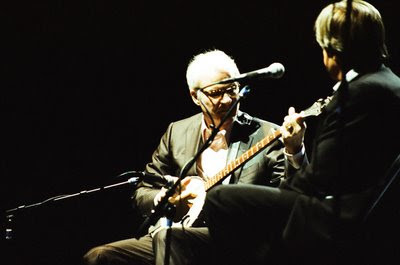 The delayed performance, well under two hours in sum, kicked off with an interview between Martin and writer Dave Barry, allowing Martin to show off his vintage banjos and their worth, or sad lack thereof. While the interview was all wit, perhaps spontaneously so, perhaps not, it was the music that made the effort of admission worthwhile. 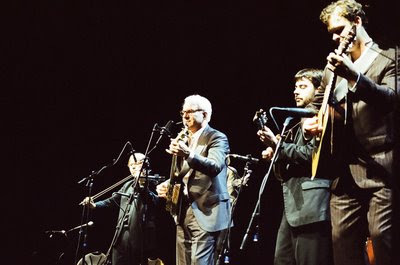 The Steep Canyon Rangers were top notch; Graham Sharp's banjo was, as Martin put it, redundant, and sole Californian Nicky Sanders played a marvelous fiddle, battling Martin as virtuoso of the night. But, oh, Steve's a real charmer. While lyrics to “Late for School” would be corny from anyone else's mouth [“Lept across three lawn flamingos, waved to Sal (he's Filipino)”], they were sharp and well-timed from his. 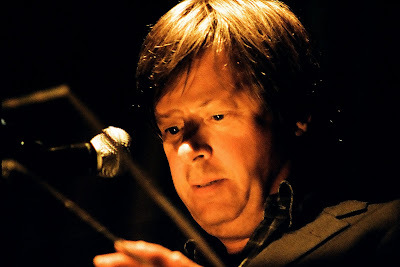 As it turns out, Dave Barry also plays a quick guitar and joined the band for one last performance, “Foggy Mountain Breakdown,” prior to the group's receipt of 2,000 standing ovations. 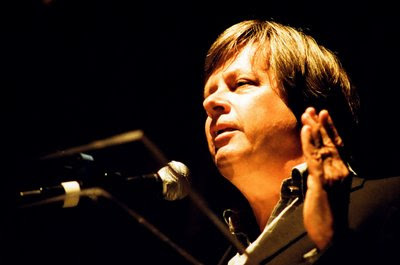 Dave Barry said a few words. Then he interviewed Steve! 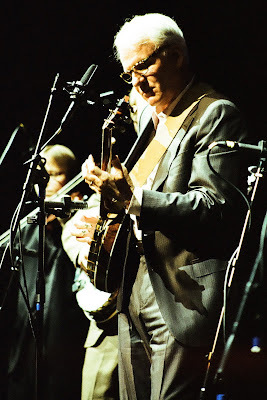 And Steve showed off his banjo. ...but it was Steve who dazzled. Swoon.